For millennia, humans have exploited trees. This has generally not been to the advantage of nature nor, in the long term, to the advantage of humans. Now we must again exploit trees but in a very different way. Planting billions of trees and shepherding them for the long term, as well as protecting remaining forests will be to the great advantage of nature and humans. Britain long ago cleared most of the land for farming and European settlers in Australia proceeded to do the same. In total, 13% of the area of original native vegetation has been cleared or modified – the figure is 60% in Victoria. The most valuable forests have been logged long ago and much of the remaining forest is harvested – to make woodchips for paper. Trees are poems that the earth writes upon the sky. We fell them down and turn them into paper that we may record our emptiness. Forests in South America are being cleared for grazing to provide meat for hamburgers, or plantations of coffee trees (rainforest shade-grown coffee is an attempt to preserve the rainforest). Forests in Indonesia are being cleared for palm oil plantations, the product of which is used in food and increasingly used to ferment ethanol to fuel motor vehicles. Now, the combined impact of burning fossil fuels and land clearing are all too apparent – global warming as the carbon dioxide in the atmosphere increases in concentration and traps heat. We have only a few years to contain this process before the risk that it will spiral out of control increases very significantly. While we can reduce our emissions of carbon dioxide by increasing efficiency and using alternative fuels we need ways of taking carbon dioxide out of the atmosphere. This is because molecules of carbon dioxide stay in the atmosphere for many decades on average. Also, even if rich countries reduce emissions (which they are yet to do) developing countries will continue to increase emissions. At present, planting many trees is our only way of sucking carbon dioxide out of the atmosphere. In November 2006, The United Nations Environment Programme (UNEP) launched “The Plant for the Planet: Billion Tree Campaign”. This campaign is backed by Nobel Peace Prize laureate and Green Belt Movement activist Professor Wangari Maathi and His Serene Highness Albert II, Sovereign Prince of Monaco. Over 140 billion trees will need to be planted to make up for just the last decade of deforestation, so one billion trees is just an acorn as Achim Steiner, UN Under-Secretary-General and Executive Director of UNEP, said. I believe that as a rich country, Australia should set an example and plant 20 billion trees in the next 10 years, or at least by 2020. This would amount to less than one thousand trees per person, or 100 trees per person per year. This may require an area of 20 million hectares and would absorb 120 million tones of carbon dioxide a year, more than the amount produced by our motor vehicles. Trees should be widely dispersed to ensure the maximum survival rate and should take advantage of recent rainfall increases in northern Australia. This would certainly be a major undertaking and the 20 million hectares, while less than one twentieth of agricultural land, is only slightly less than the area devoted to crops. Approximately 1 million square km of native vegetation has been cleared since European settlement, or 100 million hectares. It is an imposing, but by no means impossible, task. This would not only be a major contribution to the fight against global warming, it would set an example to other countries and it would be good for Australia’s “brand”. This would be of benefit for our food exports and tourism as well as for wildlife. Read about our contribution to tree planting. The breaking of the drought across most of south eastern Australia means that it is now a good time to be planting trees. According to The Economist magazine of July 7 2007, New York's 600,000 trees are valued at $122 million. Filtering air pollution is worth $11 million; saved energy consumption due to shade is worth $28 million; $36 million is the value of stemming storm water runoff; and there is $53 million in aesthetic benefits. The claim is that for every $1 million put into planting urban trees the return is $5.6 million in benefits. Given that much urban land development is at the expense of fertile agricultural land, urban forests are a viable and beneficial investment. The values quoted by the Economist do not include the food value of urban trees, which will be valuable given the rate of food price inflation. "Health experts are calling for the Victorian government to plant more trees across Melbourne amid fears population growth is damaging air quality". The Age, September 9 2011, page 7. John Fitzgerald, acting chief executive of VicHealth says hospital data from the past seven years showed higher rates of respiratory problems among people in growth corridors. He also said that trees are useful as they are able to capture some air pollutants, intercept particulate matter, and shade buildings which lowers ambient temperatures in the hot summer months. More good reasons for planting trees! According to an article in The Australian Financial Review ("Land clearing repels rain clouds", 9 May 2013, page 14) the drought in southwestern Western Australia, which started in about 1970, is in part due to land clearing. Tom Lyons from Murdoch University said that cloud bands can be seen over native vegetation but not over agricultural areas. The Western Australian government was paying farmers to clear land until the 1970's. Now it is time to pay them to reforest some of their land otherwise they will have to abandon farming. The long drought has also been influenced by global warming and perhaps natural cycles. Scientists in the northern hemisphere have reached a similar conclusion "Plant 'breath' seeds clouds, slows warming", New Scientist, 4 May 2013, page 15). They say that as plants respire, they emit chemicals called volatile organic compounds. These interact with chemicals in the air to form particle seeds that clouds can grow around. In addition to the potential to increase rainfall, these clouds also slow global warming by about 1% by reflecting sunlight back out into space. More good reasons to plant trees! Australian aid for forests in developing countries seems to have become a victim of the long forecast government budget surplus for 2012/13 turning into a deficit. The Age (May 18 2013, page 6) reports that Australia has all but dumped $75 million of projects regrowing forests in the developing world and shelved a $100 million forest carbon partnership with Indonesia. This is a disgraceful decision, in part based on poor government revenue forecasting. As one of the richest countries in the world, Australia should be contributing quite a lot to stop deforestation and regrow forests in developing countries. Especially so with our neighbour Indonesia, where so many species are endangered, including orangutans. The current Labor government is almost certain to be voted out of office in September 2013 but it is most unlikely that an incoming Liberal / National coalition will restore this important aid. Australians should register a strong protest. Individuals and corporations should also donate more to these important projects. New Scientist magazine (5 October 2013, page 17) reports that the collapse of the USSR resulted in the largest ever human-made carbon sink. As plants reclaimed the land, 42.6 million tonnes of carbon have been locked away every year since 1990 - equivalent to storing 10% of Russia's annual carbon dioxide emissions from fossil fuel. Imagine what could be achieved if we set out to reforest land by design, rather than by accident! Many trees in Victoria have died after 12 years of drought and a great many more will die next summer if the drought continues. To add to the loss, a 160 year-old elm was blown down in Melbourne’s Fitzroy Gardens on one of the windiest days on record, April 4 2008 (along with many younger trees).. 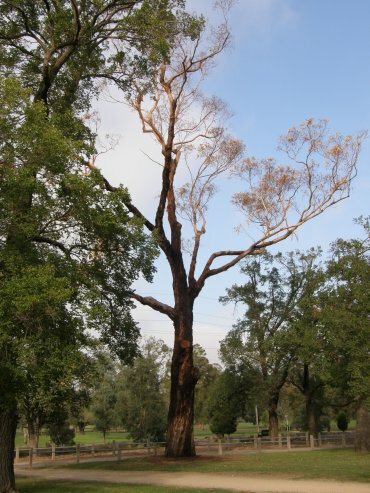 In Melbourne’s Botanical Gardens, the “Lady Loch” Algerian Oak (Quercus canariensis) tree collapsed on 15 November 2007, exactly 118 years after it was planted. I called it the Cathedral Tree because under its spreading branches, which reached more than 45 metres and touched the ground at their extremities, it felt like being under the vaulted roof of a cathedral. After the first world war, avenues of trees were planted alongside the roads from country towns and each tree honoured a fallen soldier. In many cases one is astounded by the large number of trees relative to the small population of these towns now. These beautiful avenues of honour are now in poor health which has been exacerbated by long drought. One wonders how we will remember the trees, let alone the soldiers they commemorate, unless we restore these linear woods. Hundreds of Murray River red gums are dying from lack of water. They were once given a flooding drink every few years but dams and drought have reduced the frequency of their refreshments to virtually zero. Irrigators have donated water to help save the trees and we hope that some will survive. There are only a few ancient native trees left. In Melbourne, there is the corroboree tree and the separation tree which have been saved. Elsewhere in Victoria is the Eagle tree, the Ada tree, and the Big tree at Guildford. These ancient trees are delightful and literally buzz with life as they provide food and shelter for numerous insects, birds, possums, and other animals. There are a few patches of ancient forest which have been saved. Loreena McKennitt hauntingly sings this traditional song which laments the Great Oak of Portmore which stood on the property of Portmore Castle on the shore of Lough Beg. Till the boats from Antrim came to float it away.